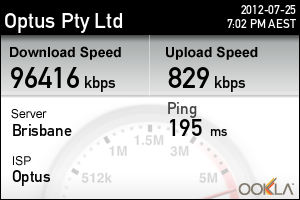 As of a few weeks ago, I have been experiencing very slow internet speeds on my household's Optus cable service; in some cases, the speed is slow to the point where even dial-up internet would fair better. Usually I would achieve around 10-20MBps download speed. However, my speeds have been dropping to as low as 0.5MBps. I have already tried rebooting the router, disconnecting the power mains and waiting 30 seconds and re-establishing my wireless connections to no avail. Could someone look into my problem please? Thanks. What does this speed test show with a direct connection to the modem? Is it a modem & router you're using or an all in one device and are you testing with a direct connection or wireless? We are also experience the same problem. With very patch speeds. Slow one minute normal the next. Would say its getting worse. 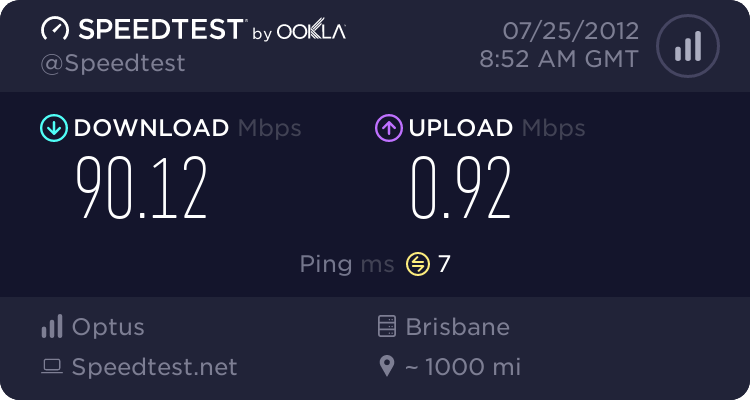 My current speed is the http://speedtest.ookla.com/result/1672278728.png but this doesn't really highlight the slow speeds that we have been experiencing over the last months since we upgraded with the new modem provided by optus! same problem here. I am on the riverwood exchange and for the past 2 weeks the speed has gone to 1mbs! I normally get 100mbs! Can someone please check my line? How's the speed been since you posted this & what type of modem are you using? Can you run a test using the above link please? Ensure this is with a direct ethernet connection to the modem. Its still patchy, but the results don't show this. Have to say the problem really started from after we set up installed the Wifi Cable Modem kit. Netgear Wireless Voice Gateway CG 3000. Do any of the speed tests indicate a problem with the speed when testing via ethernet or is it always around the above speed? I live in Ryde and have been with Optus for over a year now. Up until 5 weeks ago I had very good speeds all day and all night round, downloading around 7MB/s. Recently (last 5 weeks) my speed has dropped dramatically (300KB/s). Nothing has changed on my end. This alls started around the same time my IP address changed. I understand my IP is not Static but I had the same IP for over a year and sudddenly my IP changes and my speed fluctuates like crazy. Sometimes my speed gets back to around the old speed 6MB/s, usually during the day, but otherwise my speed fluctuates from 90000kbps to 30000kbps. I tried calling optus numerous times, a couple of times I got hung up on, a couple of times I was told I would receive a call back (which obviously, I didn't) and a couple of times I was told 'dont worry its just congestion, it will be gone with 24 hours' or 'there is some maintenance on your line, this will be fixed within 48hours'. Obviously, those people just want to get me off the phone and don't give a crapiolla about my situation. I pay about $120 a month for high speed cable. I am receiving slow speed cable with phone drop outs and HORRIBLE technical support and HORRIBLE customer support. This is pretty much my last option before I terminate my contract, and switch to Telstra. Hey Tamim - sorry to hear of this experience Can you send me some info please so I can take a look into it & get in touch? Send through our online form & we'll be in touch when we can be. I have been experenicing the same issue as of late, over the last four days our internet connection has been getting slower and slower, but only when actaully browsing. I am perfectly able to gain outstanding results when running a speed test, results below. From these results you wouldn't expect to experience a slow experiance. I've performed countless powercycles/isolation tests, have a 1Gbps direct connection with the Optus Cable Modem (DPQ3925-X), my computer specifications are way above average and have also gone to the limits of formating my entire system to ensure thats not the cause. It's understandable having congestion issues within peak periods of the day but these speeds seem to be continious and shouldn't be happen especially with result like above.